In different kind of situations you need to use a certificate for authentication or signing. I needed on because I was setting up a Identity Server the Identity Server V3 (https://identityserver.io) to be exact. Within this Identity Server a certificate is used for signing. For testing purposes you can download one from their GitHub repository. But if you would like to buy one or generate one you will have to do some extra work. The certificate that’s needed can be saved within the application or a more manageable solution by saving it within Azure. 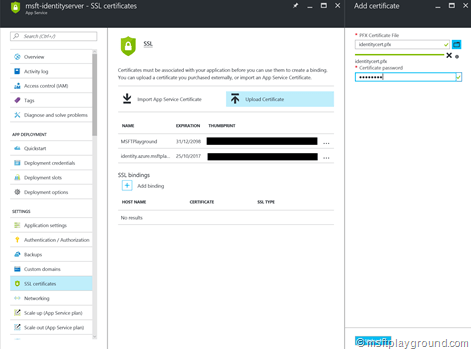 On a blog page from Microsoft I found out how you can save the certificate within Azure and use it with your application. As this is a guide made with the old portal I rewrote the guide with steps that need to be down within the new Azure portal (https://portal.azure.com). Navigate to your created Azure App Service for example a Azure Web App. In the menu blade pick the option “SSL Certificates” under the “Settings” section. In the SSL Certificates blade upload your certificate and supply the password. When the certificate is uploaded the Web application it self needs to be instructed to load the certificate. This can be done by adding a application settings called “WEBSITE_LOAD_CERTIFICATES” and adding the thumbprint of the certificate you want to be loaded as the value. If you want to load multiple certificates you need to supply the value as a comma-separated list. In the menu blade pick the option “Application Settings” under the “Settings” section. In the newly opened blade scroll down to the section called “App Settings” and add the settings. Before publishing your application to the cloud you can also add the value to your web.config. This method can simply be called by supplying the thumbprint of the certificate that you for example have saved within the web.config/ app settings. 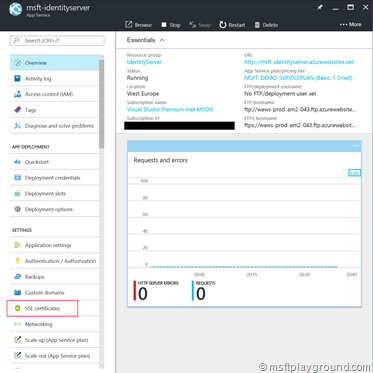 The complete solution can be hosted within a Azure Web App Instances but preferable within a Azure App Service Environment. 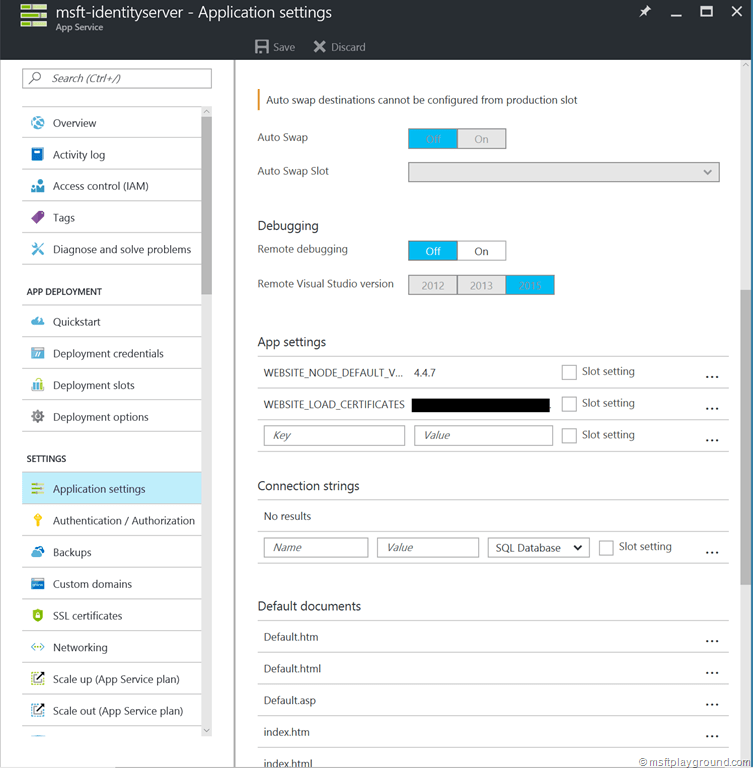 This is because a Web App instances is a shared resource on a VM witch is not a good security practice for a Identity Server, so deploying it to a Azure App Service environment is preferable as this is not a shared environment. 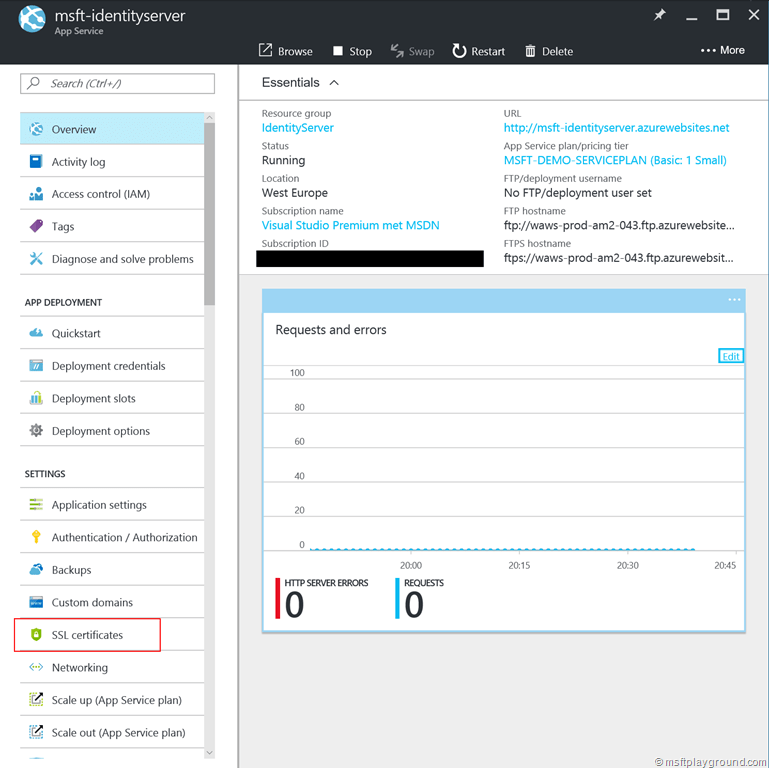 We’re implementing the same exact thing in Azure App Service, IdtSrv3. We’ve been having some trouble figuring out how we were going to load in the cert, then we found your blog here. We followed the steps you gave, but we are seeing the below error being thrown. Any ideas? System.InvalidOperationException: IDX10614: AsymmetricSecurityKey.GetSignatureFormater( ‘http://www.w3.org/2001/04/xmldsig-more#rsa-sha256’ ) threw an exception. SignatureAlgorithm: ‘http://www.w3.org/2001/04/xmldsig-more#rsa-sha256′, check to make sure the SignatureAlgorithm is supported. Exception:’System.Security.Cryptography.CryptographicException: Invalid provider type specified. at System.IdentityModel.Tokens.AsymmetricSignatureProvider..ctor(AsymmetricSecurityKey key, String algorithm, Boolean willCreateSignatures) in c:\workspace\WilsonForDotNet45Release\src\System.IdentityModel.Tokens.Jwt\AsymmetricSignatureProvider.cs:line 147’. If you only need to verify signatures the parameter ‘willBeUseForSigning’ should be false if the private key is not be available. —> System.Security.Cryptography.CryptographicException: Invalid provider type specified. Are you using the correct Algorithm?